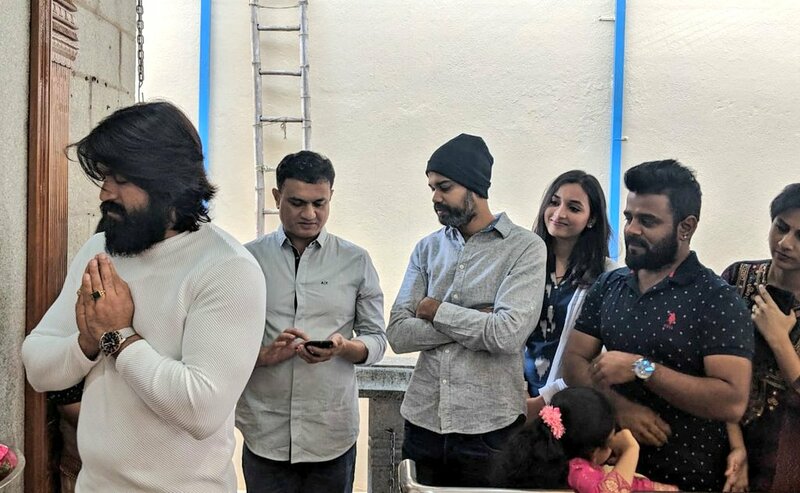 Rocking Star Yash and Srinidhi Shetty starrer the craziest sequel ever KGF 2 kicks off on Wednesday formally with the pooja in Panchamukhi Ganapathi Temple and Sri Kodandarama Swamy Temple in Bengaluru. Yash, Srinidhi, director Prashanth Neel, other cast and crew attended the occasion. Actual schedule to commence from April. With KGF 2 it is expected that many actors from other industries to make their debut into Sandalwood. However, makers will come up with a complete list of the cast very soon with a formal announcement. KGF 1st chapter which was released on Dec21st 2018 with huge expectations, four years of team's effort and turned out to be an all-time blockbuster in Kannada industry thrashing all the previous records. This movie also released in other languages Telugu, Tamil, Malayalam and Hindi fared really well at the box-office in the respective languages. KGF also becomes the first Kannada movie to mark 100cr gross at their home enclave. KGF is a period Rhapsody which circles around the main lead Rocky Bhai, who aspires to become the undisputed person in the universe. This drama is directed by Ugramm fame Prashanth Neel who elevated every scene with hair-raising dialogues. This project was bankrolled by Hombale Films and music composed by Ravi Basrur. DOP by Bhuvan Gowda. Yash got pan India recognition, movie lovers across the nation eagerly waiting for KGF chapter 2. This project is touted to be bigger than its chapter one. Hope the team exceeds the expectations.